We have been given a Dicky Bag to test - it's a sealed neoprene bag to carry dog poo in until you can find a proper place to dispose of it. We absolutely hate it when other dog owners don't clear up behind their dogs – there is no excuse. We have seen this kind of product before – but this is a trendy and extremely convenient way of carrying your dog poo until you find a dog poo bin or get back home. Our first impression was – wow, it comes with everything you might need! It comes with spare poo bags (which fit in the lid), an air freshener (which fits in the bottom) and a hand sanitiser (which, I think, you can buy separately) which still leaves plenty of room for bagged up poo! It even came with a belt clip so you don’t have to carry it around all the time. We decided to test it by taking our dog Becky on one of our extremely long walks around the fields where we live. It was already pretty hot when we set off and, true to form, it wasn’t long before Becky did one of her honking great big no. 2's! So we bagged it with one of the bags stored in the lid and placed it in the bottom of the Dicky Bag. Nigel had it clipped on to his jeans belt loop so was desperately hoping it wouldn't leak! As it was getting hot, we fully expected to start to get a whiff or two of Becky's poo - thankfully nothing!! Well, we walked and walked for about three hours in total. We trudged around the fields, over streams (some of which had water in), through prickly hedges, up and down hills and, to top it off, Nigel fell in a ditch (oh I wish I had my camera with me!!). When we finally arrived back home we fully expected to smell the dreaded "poo bag leakage" smell, especially as the Dicky Bag had been squashed when Nigel fell in the ditch. But, thankfully, there was no smell whatsoever coming from it as the poo was well sealed inside (if a little squashed). To say the least we were well impressed with the it. If you do have an unfortunate case of poo bag leakage at least it is well sealed inside, and which itself is made of neoprene so is fully washable. We had it clipped to our jeans, but you can buy a shoulder strap if you would rather carry it that way. It also comes in 5 colours and 4 sizes depending on the size(s) of your dog(s). It is definitely better than the similar products you can buy which are made from rigid plastic. If Nigel had fallen with one of those clipped to his jeans I am sure he would have smashed it and probably been injured by the broken pieces. All in all, if you have dogs it's a great and easy way of carrying dog poo until you reach a suitable disposal place. We would thoroughly recommend this product. Are you going to order one? If you enter the code *FREE-79* on the Dicky Bag website when you order, you will receive a FREE STRAP which is worth £6.50 !!! If you would like more information about the Dicky Bag, please click here to take you to their website. Just remember, there's no excuse for leaving your dog's poo behind now! 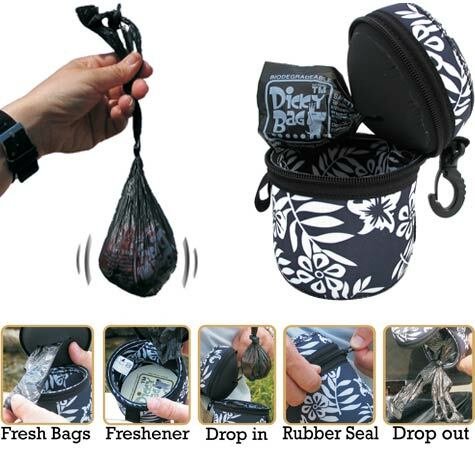 Click here to let us know what you think of the Dicky Bag.